Alex Bedser is not exactly a popular name for most cricket fanatics and many would not have even heard the name. But in his time he was on of the best bowlers around in Cricket and it was a reputation he polished further by taking Don Bradman’s wicket six times in a single test series. 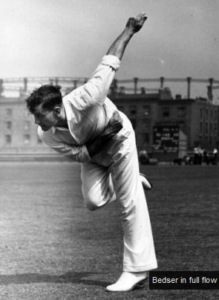 Alec Bedser was 28 when he made his debut against India in 1946. This was quite unfortunate as he did play for nine more years with 236 wickets from 51 tests. As a fast bowler playing he was playing since the age of 28 which meant he was playing Test cricket well after his peak which is usually early to mid twenties. Unfortunately World War 2 was taking place in those days and Bedser lost many of his Cricketing years. When he retired he was the highest wicket taker in Test cricket. In the glitz and glamour of today’s cricket not many would remember a 91 year old ex-test cricketer but Sir Alex Bedser was someone who truly deserves to be remembered. Afterall not many bowlers could really boast of taming Bradman six times. Sir Alex Bedser died after a short illness on 4th April 2010.
Who will make it to IPL semi-finals? Rajasthan Royals should play (idea) “oongli” cricket!